Well this one looks at least almost normal, if you scratch the little decal thingy on the right, and if you cover those silly speakers. 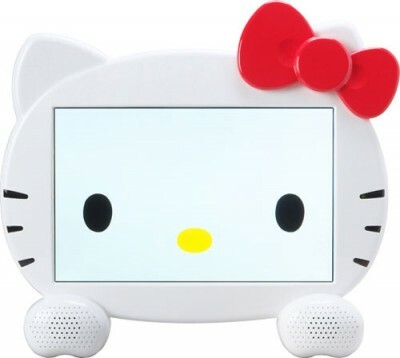 What is insane is that this LCD TVis probably costing double the price of a regular LCD TV just because it’s hello kitty, and we all know that to hello kittyfy something is easy to do on your own anyway. As a joke my b-day was just yesterday and I asked my mom to get me the pink nano iPod as my hubby keeps stealing my electronic gadgets if they look to regular. And my sis knows I have nothing wrong against one or two cute HK items here and there, so my mom got me the pink iPod and my sis bought a HK sock like iPod cover to slip it into when not in use, now DH stays as far as he can from it and I can still enjoy my own music without having to run after my sweeter half to get back what was mine. The better to broadcast the propagana machine of Life with Hello Kitty, and maybe HKH? That screen looks like it’s 5″X10″ big in terms of LCD. I bet you it’s like small like a computer monitor, but with MUCH LESS viewing space. Yeah, that looks like CRAP! I’m so happy it’s been weeks since I bought anything hello kitty! Blech. Another piece of worthless crap for the hoardes to spend their money on. It’s sad actually. I feel sorry for all the schmucks that spend their money on this junk. Aren’t we about due a Darlene rant, in which she will completely ignore the fact that this object has been flamed from both sides of the HK marketting tat divide? This has got to stop. Hello Kitty is a disease of the mind. It rots away at the intellect of mankind, and strips the soul from anything that is wholesome. 2) End distribution of Hello Kitty products. at least this one looks a little normal and there isn’t much pink. i don’t like how the buttons are though. i mean, if i had my own hello kitty room that would be the only reason i’d get one of these. as for now i can stick with buy a bigger tv from a name brand. how can i play video games on such a small screen?! This is a completely hideous piece of crap. The diamond-shaped set of buttons IS NOT HELPING. OMG!!!! I love it. I would totally mount this in my kitchen that would go right along with my theme of a HK kitchen. If anyone has any idea of where to buy this, let me know. Thank! That’s so tacky. It doesn’t look HK at all. It should at leats be cute and round. It’s just a T.V with a really cheap looking sticker on it. You’d be better off buying a nicer one. were can i get one tv hello kitty and how much? Yeah, i adore HK, but even to me that looks like a complete pile of crap! Sanrio should stop making stupid things people could buy for half the price and stick a 29p Hello Kitty sticker on. The black and red t.v to match any ninja or geisha room you might have. 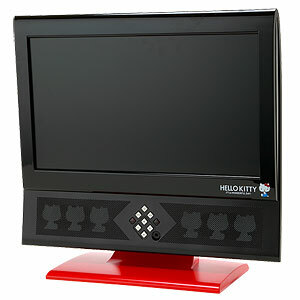 I love the black one, I would use it to look at Hello Kitty Blogs and help in the spread of Male fandom. I find it hilarious how people can loathe something that others love so much. If it makes people happy then why waste your own energy despising it? Nothing seems more silly than that to me. Hello Kitty is harmless and brings joy to many people, including myself. It is clearly a very popular franchise abd thus they continue to make more products, and that I am very grateful for, because Hello Kitty is a huge aspect of what makes me happy. I wouldn’t actively put down whatever it is that makes you happy and insist it’s unnecessary. If you are that determined to waste your energy on hating something for no reason, that’s fine. And just so you know – the writer of this blog is actually a huge Hello Kitty fan. It’s entertaining how many people believe every word he writes. Makes this blog that much more entertaining. So thanks! That third TV is just *begging* to have something horrible photoshopped onto it. I really like the 3rd one! i wouldn’t be buying any of the hello kitty movies. hello kitty in the movies is pretty annoying. I’d rather just buy merchandise without having hello kitty talking! please please please advise me where to buy this item.